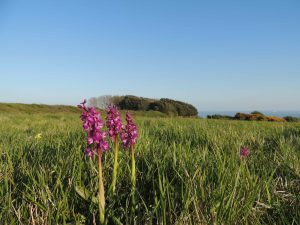 We are fortunate in the West Country to have some wonderful orchid populations in those bits of habitat that haven’t lost their biodiversity to intensive farming. One outstanding area is the Purbeck Coast in Dorset west from Durlston Head. 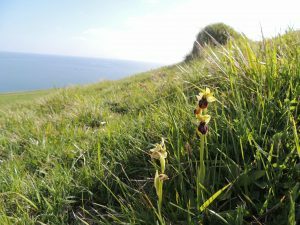 It is really worth a visit in late April to see three of Britains early flowering orchids; the early spider orchid. 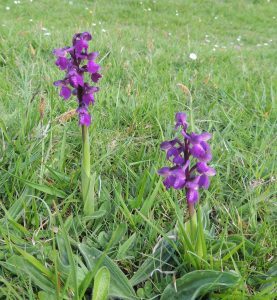 the green winged orchid and the early purple orchid. 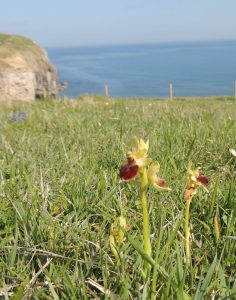 The first two are flowering in abundance near Dancing Ledge and all three can be found in the meadows at Durlston Head. The orchids are particularly good this year. 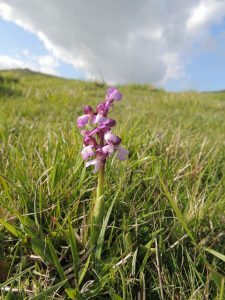 I think that this is partly due to the wet springs in the past two years but also due to the excellent management of the area by the National Trust and Dorset County Council who use low density grazing by Hereford cattle to maintain the grassland.